The traditional view says when a man ages, he looks more distinguished. But now, as men get older, many seem to worry about the same things women do: their looks and their hair. "Early Show" co-anchor Erica Hill noted, "Prince William is living the life of a true Prince Charming, but while youth is on his side, his hairline is running away -- and the headlines, especially in Britain -- are downright mean." 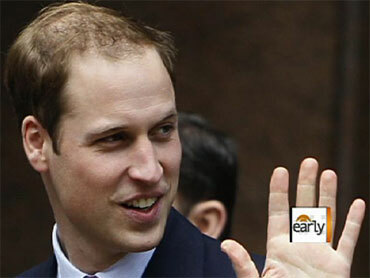 Some, she remarked, even suggest the 28-year-old may be rushing to the altar before getting "balder." While there is no proof that prompted his proposal, there are 80 million Americans who are losing their hair, and experts say single men worry the look will make them less desirable. Some observers think even President Obama has taken to dying his hair. Kathleen Gerson, professor of Sociology at New York University, said, "For better or worse, men are now feeling the same pressures that women have felt for decades." An explosion of men's magazines is driving home the image of a perfectly sculpted body topped by a full head of hair. Men are spending $1 billion a year on hair growth products alone. Women are also making gains in earning power, improving their wages by 28 percent compared to men in the last 30 years, meaning they can afford to be more pickey in choosing a partner. Gerson said, "As women have become more independent, they're looking to men in much the same way that men have historically looked to women." The 1950's image of a woman desperate to find a man has gotten a makeover. Now men are paying as much attention to their waistlines as their wallets. But, Hill remarked, Prince William has one advantage over most men: Someday he may be able to cover up -- with a crown. Also, on "The Early Show," Lesley Jane Seymour, editor in chief of More magazine, shared her thoughts on this issue. Click on the video below for her full interview.